That's a wrap from us this evening. Thanks as ever for your company tonight - join us on Tuesday night for League Cup and FA Cup action. Bonanza! Everton boss Roberto Martinez, speaking to BBC Sport: "It was a really important win. It was important to bounce back. It now allows us to move forward and focus on the Southampton game. "Today in front of goal we were clinical and full of quality. There were pieces of individual magic. The way Ross Barkley opens the line of pressure and hits that quality of strike is outstanding. To score three goals is always a really good strength to have in your side. "I thought the performance today was a difficult one because QPR came with a lot of intent and energy but to be able to score three goals past that system shows the quality in our side. "It is too early to make any sort of assessment of Kevin Mirallas. It is an ankle injury, we will assess in the morning and take it from there." Everton manager Roberto Martinez confirms that Kevin Mirallas 'has a bad ankle' and will be scanned on Tuesday. Harry Redknapp, speaking to BBC Sport: "We played well. I thought there was really something in the game for us but then there was a great strike by Ross Barkley, although a deflection carried it into the net and then there was another deflection for the free-kick. The third goal was important because I thought there was an edgy atmosphere tonight, the players were edgy but we gave away a bizarre goal for the third. "I was not that disappointed with the performance tonight though, I thought we played OK. You need a little luck sometimes and it went their way a little bit tonight. I have no doubts we will get points away from home. We pressed better as a team and I thought, up until they scored, they did not have many ideas about how to break us down. I am optimistic. We have played difficult teams away from home, the ones you expect to be up there and the ones who are in form." United claimed their sixth successive win by beating Liverpool 3-0 on Sunday and lie third, eight points behind leaders Chelsea and five adrift of Manchester City. Speaking on BBC Radio 5 live on Monday, the former United assistant coach was asked if they could win the league. "Yes they can," he said. "The players believe that they can win the title and so does Louis van Gaal." Everton's Ross Barkley, speaking to Sky Sports: "I thought it was on target when I hit it but the deflection helped, it got us under way and we got the three points, that is the main thing. "Also getting three goals against QPR was great too. We will take each game as they come and hopefully get things right on the pitch." QPR are only the second team in Premier League history to lose their opening eight away matches in a season, after Bolton in 1995-96 who lost their first nine. Everton's Steven Naismith, speaking to Sky Sports: "It says what we have done over the last year or so that teams come and see us as a threat. I thought the keeper got a hand to my goal but it was still going in the corner. QPR are an experienced team, we knew it would be tough but we scored goals at vital times. "Going into the Europa League this year has given us a few more problems in terms of the amount of games we play but we want to take the club to the next level and that involves playing games week in and week out." Everton are seven points shy of the top four at the moment, but there are plenty of points to play for in the next few weeks and no Europa League to worry about. Can the Toffees challenge again? The phone lines are open for the 5 live social. Can Man Utd win the Premier league? Can anyone stay up if they can't win away? Can Everton kick on from tonight? But that miss doesn't matter one jot. A comfortable win for Everton. QPR's away day woe continues. Lovely effort! Arouna Kone runs at the tired QPR defence before slotting in Samuel Eto'o, he goes for the side-foot and slams it against the base of the post! So Everton will move above Liverpool and back into the top 10 tonight. A good result - if not a great performance. They have done enough. Ross Barkley takes the free-kick, bends it over the wall but wide. Arouna Kone gets a run out as Kevin Mirallas departs. We'll let you know as soon as we hear about that injury. Looked like his ankle. Kevin Mirallas has been injured in that tackle from Jordon Mutch. It looks like his ankle gave way under the weight of the QPR midfielder. Mirallas leaves the field on a stretcher, head in hands. That looks serious. Jordon Mutch scissors Kevin Mirallas and goes into the book. That was ugly. It's also the first booking of the night. Mark Lynch: QPR down the bottom, getting well beaten again away from home and yet again no bookings either. Not exactly fighting to stay up. Terry Devaney: Everton are a completely different team with Naismith in it, he's easily one of the most underrated players in the league. Muhamed Besic will be sent off at least three times this season. How's that for an outlandish prediction. But it's just the way he tackles. The crowd love it - I like it - but referees won't. He launches himself at Joey Barton and takes the ball clean as a whistle, but he's only a slight mistime away from a red. Everton have now gone six Premier League games without keeping a clean sheet. I'm sure that will irk Roberto Martinez. But barring a magical ending, they will take the points tonight. That's more like it. Seamus Coleman has been unusually reserved tonight but a lungbuster of a run is found by Ross Barkley, the Irish full-back puts his head down and his foot through it, cracking hit but Rob Green pushes it away. "QPR are on top at the moment. They need to put the ball into the box, test Sylvain Distin and Phil Jagielka and be more ruthless when they get into those positions." Everton deserve to concede that goal, they've totally turned off since going 3-0 up. Hello! Out of nothing, QPR have one back and Bobby Zamora has his first of the season. Good feet from Jordon Mutch as he switches the ball and gets a shot off, Tim Howard can only parry it out and Zamora has an open goal. A fist pump and a quick gather of the ball. Zamora believes. Do you? Somebody told me recently that Samuel Eto'o has got a car worth £1.5m (MILLION!) parked in a garage in Manchester. Imagine backing into that by accident? We won't be doing knock-for-knock. Leroy Fer - who nearly joined Everton once upon a time but failed a medical - is rested for the last few minutes as Niko Kranjcar gets a run out. Change up front for Everton too as Romelu Lukaku is switched for Samuel Eto'o. I'm running out of ways to tell you the same thing here. QPR are having all of the ball, Everton are watching them, Tim Howard hasn't had a shot to save. Leave your name and number and I'll call you back if anything happens. "QPR's play has deserved a goal. Everton haven't been brilliant but they've done what they've had to do. The goal before half-time killed this game and it wasn't just that goal, it was the way it went in via that wicked deflection." Aiden McGeady made the third goal but now he is off, with Steven Pienaar on in his place. Into the last 20 minutes at Goodison Park. Phil Jagielka remains very vocal in the Everton back four, but the intensity in the game has totally gone. That third goal has put a sleeper hold on it. Tap out. "You sense in the last few minutes that Everton have taken their foot off the gas. A substitution might just inject a bit more life back into the game. It's a big moment for Everton in their season and they just need to relax a little bit." Everton are at Southampton on Saturday, while QPR face West Brom. Harry Redknapp's side will need another home win - and they will have Charlie 'prolific brickie' Austin back in the side. "QPR find themselves in really nice situations and play really nice football but when they get to the 18-yard box they lack that bit of devilment. "You need to pick up a couple of victories away from home if you want to survive. You can't rely entirely on your home form." Everton have mentally banked the three points and gone home. They're already thinking about the game at the weekend. QPR seeing all of the ball now, freeing Mauricio Isla down that right wing again, he cuts it back to Jordon Mutch - who leans back and fires high over the bar. Poor finish. Mauricio Isla has impressed me for QPR tonight. He has been up and down all night, has a fine first touch and looks to thread balls into feet. Now he has Bobby Zamora to aim at too, but the England man hasn't seen much of the ball yet. Joey Barton has a shot well blocked and chance for Everton to counter! Steven Naismith has three men up front but he punts the ball out of play out wide. Poor ball. Decent spell from QPR as they switch the ball out wide but Kevin MIrallas puts the tractor beam on and closes down Mauricio Isla, putting it out for a corner. Play-off legend Bobby Zamora is on for QPR. He hasn't scored this season. Just the four needed in half an hour tonight Bob. Zamora replaces Matty Phillips. 4-4-2. QPR are the first team to concede 30 times in the Premier League in 2014-15 as an Everton fan strips down to just his blue pants. No need for that just yet. That was as bad as it gets defensively from QPR. Three errors in a row and the ball is in the net. Game over. What a terrible goal to concede. Dear oh dear! It starts with Rob Green fluffing a clearance, shanking it no more than 20 yards out. Richard Dunne then miscontrols his clearance and Everton have the ball on the edge of the box. They work it out to the right, Aiden McGeady crosses in and Steven Naismith heads back across goal. QPR centre-halves Nedum Onuoha and Dunne both have a swing at it on the line but the ball skims into the net. Richard Dunne on the swing! Over the bar. As the colleague to my left points out, if that was towards his own net he would have buried it! Phil Jagielka loses the ball on the halfway line, problems here! Leroy Fer nips in but fair play to Sylvain Distin as he covers well to clear his lines. Don't lose it there Phil! QPR must make a fast start you feel. Joey Barton does well down the left but they then lose the ball and Everton break. Kevin Mirallas peels into the box, he goes down as Richard Dunne steps across but that's never been a penalty. As you were. No changes at the break. Everton kick us off. And Everton have never lost when leading by two goals at half-time in the Premier League. I'm not going to lie to you QPR fans, it doesn't look good. I still think there is more to come from Glenn Hoddle, on the music front, by the way. Diamond Lights II. Get on it. QPR have never come from two goals down to get a point in the Premier League. Shake hands and call it a night then lads. Or will Harry Redknapp's men pull off one of the great comebacks? Bobby Zamora? Niko Kranjcar? Shauny Wright-Phillips? The three attacking options available for Harry Redknapp tonight. Get them all on. check out this Christmas video from QPR. Remarkable. Everton are above city rivals Liverpool at the moment as a result of those two first-half goals. They will hope to get Romelu Lukaku involved more after the break though, the big man only had 15 touches in the first 45 minutes. The fewest of any Everton player. Applause all around at Goodison Park now as the players come off the field. A flat opening half hour but two goals - the first a brilliant effort - has at least lifted the crowd. "This has been much better from Everton in the last 15 minutes. They have played up to the front man a lot more and with much more intensity and they have got runners in behind." QPR's suspended striker Charlie Austin: Some strike that from Barkley, Qpr been doing very well.. I would say that was against the run of play. A third goal before the break would absolutely end this one and Aiden McGeady is a foot away from finding the far corner. He cuts on to his left foot, curls one nicely from the edge of the box but it spins just past the corner. Two deflections, two goals! Kevin Mirallas will claim it but his free-kick takes a huge deflection off Eduardo Vargas, who attempts to block it with his head but only succeeds in sending the ball to Rob Green's right, with the keeper committed the other way. The free-kick was struck well by the Belgian but that is a massive stroke of luck for the home side. QPR have only had 35% of possession but there's been nothing in the game to be honest. Both sides looked pretty well matched until Ross Barkley rooted around in the top drawer and pulled out a classic. "There's a special Xmas treat, right there, from Ross Barkley!" QPR have kept only one clean sheet in their last 16 Premier League away games. More importantly, they've only scored two on the road all season and need to double that to win tonight now. Is Ross Barkley as good as Gazza? Not yet. 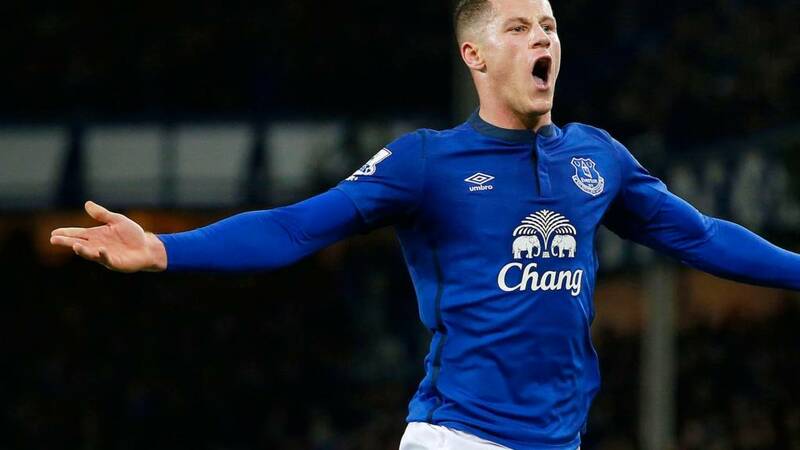 Is Ross Barkley better than Gazza when he was at Everton? Yes. "Barkley reminds me of Paul Gascoigne, the way he goes past players with no effort. He runs with his head up. "He doesn't need to shout for it because his body language says 'give me the ball - I'm going to do something that's better than anyone else on the pitch'. He's a special talent." The Everton fans are heard for the first time all night as they celebrate that special strike. Ross Barkley's first goal of the season. He'll do well to score better. "That is a special goal by a special player. He's been the best player on the pitch so far. It rocketed into the net and Rob Green had no chance." Pick that one out! An absolute beauty from Ross Barkley! He lifts this game out of the gloom with a piece of genius. Picks the ball up in his own half, plays a one-two with Romelu Lukaku, works the ball on to his left foot and then crashes into the roof of the net from 20 yards. The ball takes a nick off the back of Mauricio Isla but take nothing away from Barkley. Quality goal. Get it to Matty Phillips on the right wing. That seems to be QPR's approach so far, judging by the stats below. Muhamed Besic slides in for another forceful tackle, putting Eduardo Vargas on the floor again, but he wins the ball again. I like the cut of his jib. Joey Barton is then dumped on the deck, Tim Howard flaps at the free-kick and Eduardo Vargas almost turns it in. Phil Neville's wife keeps him in line obviously! "I am in favour of Christmas parties. But you have to modify them, you've got to take your wife to these things - that way everyone has to behave when they're around." "Unusually quiet at Goodison. They're all doing their Xmas shopping online." That's a very niche lyrical reference, I apologise. But that's better from Everton! Seamus Coleman finally gets forward, cutting back a good ball to Steven Naismith, whose half-volley is well struck but hits Romelu Lukaku on the back. He's a big man, not easy to miss. Seconds later Kevin Mirallas fires over from 20 yards. Is there a lack of confidence at home? Everton seem to be devoid of it. And now I have Idlewild lyrics in my head. The men in blue keep taking the easy, but not the progressive, option on the ball. The crowd don't like it. "There's definitely opportunities for QPR to counter-attack, there's a vast amount of space in front of Sylvain Distin and Phil Jagileka. "I've been impressed with Eduardo Vargas so far. He's dropped deep and turned to run at the defence and he's a brought others into play as well." If I ever make it to Premier League manager, that would be a week's worth of wages docked for Leighton Baines and Steven Naismith. That's even worse than hitting the first man at a corner. Better from Naismith as he steps into space 25 yards out and fires a left-footer at Rob Green. Ambitious Rangers anyway! Junior Hoilett shoots from at least 35 yards, highly speculative, and straight at Tim Howard. MY NUMBER ONE PET HATE IN FOOTBALL! I hate this. Leighton Baines takes a throw-in, a bit too hard, and Steven Naismith can only volley it back over his head and out of play. Is there anything worse?! Terrible away form so park the bus? No sign of that from QPR so far - they have been on the front foot, as the graphics below show. Everton's average positions are shown in the first image, QPR's in the one underneath. Muhamed Besic loves a tackle. The Everton man launches into a challenge, both feet off the ground as he nicks it from Eduardo Vargas. He wins the ball, but QPR have the free-kick. Joey Barton's delivery is a tester but Junior Hoilett shins his shot wide at the back stick. Frustrated, mumbled grunting from the stands at Goodison as Everton dither over a free-kick and end up giving the ball away. The sort of monotoned jeering you hear in the House of Commons. "Everton need to get Ross Barkley on the ball. He's already shown what he's capable of with a great pass for Steven Naismith. "When he wasn't picked last week [against Manchester City] he was gutted. When he came on, he showed Everton need someone like him - with a bit more energy and quality." You can keep your pretty intricate passing, sometimes you need the big ball over the top. Ross Barkley pings it 45 yards over the top into space, brilliant ball, Steven Naismith gallops on to it on the left and cuts it back inches ahead of the onrushing Romelu Lukaku. The crowd appreciate that one. Get it forward! "You can definitely sense a nervousness around Goodison tonight. "I've seen them a lot recently and they've played some good football but what fans demand and expect is to play quicker up to Romelu Lukaku, so he can use his pace and strength. "They're a lot more expansive this year, so when you give the ball away, one pass and you're exposed." Ross Barkley has started well in this deeper role than usual, wants the ball all the time and using it neatly. Everton do look a bit short of confidence though. A few players have played it backwards when there was the chance to get it up to Romelu Lukaku. Corner worked neatly again, the ball is half cleared by Leighton Baines and QPR winger Matty Phillips fires in a shot on the bounce, he tops it a bit off the instep and the ball spins narrowly over the top. Good effort, a difficult ball to strike. Pretty even start with both sides moving the ball neatly and nicely. Yun Suk-young is then tripped and QPR do win a free-kick. Eduardo Vargas whips it in and Richard Dunne flicks an effort off a defender for a corner. "I've played in plenty of Goodison Park night games and the atmosphere is usually electric but it's a little bit quiet at the moment. You can sense a bit of the tension. "QPR are flooding players forwards at the moment and it looks like something they've worked on." It's a bit tense and nervy at Goodison Park - but that gets the crowd going! Muhamed Besic wins the ball back with a cracking tackle, firm but fair. Joey Barton then clips Seamus Coleman but somehow Everton don't get the free-kick. Surely a foul? Eduardo Vargas has QPR's first shot of the night, right into the small of Leighton Baines' back. A stinger on a cold night. "It's a big night for Muhamed Besic and Ross Barkley in midfield. Both are more used to playing as part of a three, so they will have to be disciplined to keep their shape. "The key for QPR is to stop Leighton Baines and Seamus Coleman. If you stop them, you will stop a lot of the Everton attacks." Ross Barkley does offer something in that deep role that Gareth Barry or James McCarthy don't - he can dribble. Barkley immediately carries the ball 30 yards or more with the ball at his feet. Attacking endeavour from the middle - but he needs to also stay disciplined. Here we go! Under way at Goodison Park. Man in a Father Christmas fake beard? Tick. Almost time for kick-off. Almost time for Christmas. On the sparkling form of Manchester United goalkeeper David De Gea: "He's improved his physicality. When he came to England, he was like a stick-thin lad but he's done a lot of good work in the gym to improve. "He realised he had to change his game from being just a shot-stopper to commanding his box. "He's winning games on his own. I played with Peter Schmeichel who did that and you can count a few occasions already this season where De Gea's done it." With both full-backs bombing on and Kevin Mirallas, Steven Naismith and Aiden McGeady all behind Romelu Lukaku, Everton could be left wide open in midfield tonight. On whether Manchester United can win the Premier League: "Yes they can. "There's two reasons: I didn't believe it until last Monday against Southampton. It wasn't during the game, because they weren't very convincing, but what happened afterwards. The players went to the away end to applaud the fans and Louis Van Gaal was there and Ryan Giggs was there. "All of a sudden, they're showing that indomitable spirit and that takes you far. I've been part of teams that have won titles because of that spirit. They've got momentum and you never know. "They've also got the firepower. There are similarities with Liverpool last season: No Champions League, the firepower and they have to improve defensively. Liverpool didn't win the league last season but United have got some players who have experience of winning the title. "When it comes to March and April, they've still got players who have won league titles and been across that line." Goodison Park beginning to fill up as the Salvation Army band take to the pitch. Harold Bishop will enjoy that one. Looks a cold, wet evening on Merseyside as the rain teems down. Goals on the cards? Let's hope so. Everton: Howard, Coleman, Jagielka, Distin, Baines, Besic, Barkley, McGeady, Naismith, Mirallas, Lukaku. Subs: Robles, Eto'o, Kone, Pienaar, Stones, Garbutt, Alcaraz. QPR: Green, Isla, Onuoha, Dunne, Yun, Phillips, Mutch, Barton, Fer, Hoilett, Vargas. Subs: Ferdinand, Hill, Wright-Phillips, McCarthy, Kranjcar, Henry, Zamora. Christopher Uche Uwaonu: Nemanja Matic will do well as a bouncer, he shields the back four with relative ease, his absence was obviously felt at Newcastle. Michael Campbell'New: Steven Gerrard should be a waiter because he always hands it on a plate. Everton have made more errors leading directly to goals than any other team in the top division this season, with eight. Can they cut it out tonight? future of manager Ally McCoist: "Supporters will not want to see Ally McCoist go. There's real turmoil going on at Rangers. Mike Ashley needs to sort it out and sort it out fast." Half an hour out from kick-off at a wintry Goodison Park. I've seen reindeers, Christmas jumpers, face paint and snowman outfits at Everton tonight. They are in full festive flow. Three points is all the fans will want though. Champions League last-16 draw: "I've seen Barcelona recently and was not impressed. I think they're a slow, ageing team. I wasn't impressed with how they've integrated Luis Suarez into the team. "I think Manchester City have got a hell of a chance to beat this Barcelona team. All three English clubs have a good chance of going through." While the Toffees have come unstuck domestically so far this season, their Europa League campaign has been a sweet success. is a last-32 tie with Swiss club Young Boys. Roberto Martinez's side will travel to Bern for the first leg on 19 February before the return fixture at Goodison Park seven days later. Young Boys finished second in Group L behind Napoli and are third in the Swiss Super League at the halfway stage of the season. Everton ambassador Ian Snodin said the Merseyside club's ambition should be to go all the way to the final in Warsaw. He said: "The club and players are enjoying it, but first and foremost you want to win the competition. Everton need some silverware, it's been a long, long time and we're desperate to win some silverware." Ed Quoth the Raven: Alternative careers - Yanick Bolasie as an improvisational comedian - you never know what he's going to do next. Gary Cahill as a contestant on the next series of Splash after Saturday. Peter Stones: Mario would make a decent hat stand, or living statue. The Nayak: Jose Mourinho - CEO at PR Firm, Arsene Wenger - University Professor, Diego Costa - Bar Bouncer, Harry Redknapp - Parliamentarian. Unsurprisingly QPR boss Harry Redknapp was asked for his views on Christmas party season. Surprisingly, 'Arry doesn't go in for them. "I've always said I've no time for Christmas dos," he said. "It's a busy time of year. I don't know what players are thinking of going out on dos at this time. "But they went for Sunday lunch, not a Christmas party. It was just a few lads having lunch. That's it." Vinny Person: Shocked not to see Osman not even on the bench? Such a decent player. Andy Donley: Being said #spurs, #LFC, #AFC and #MUFC having bad seasons but #EFC have gone under the radar - terrible start. I've never subscribed to Roberto Martinez hype, got Wigan relegated when they won FA Cup. Needs to turn #EFC's season around. John McEnerney: QPR without their main goal source & EFC feeling good at avoiding a tough draw in the EL, can see this going the home sides way. More from 5 live on the perils - and the pluses - of football's Christmas party season. Burnley boss Sean Dyche: "We'll all have been on parties back in the day when fans would join in, have a laugh, you'd connect with them and there was no big drama. We all had a week to recover and there was no problem. "These are human beings working very hard in a very stressful job and they are back training hard on the Monday morning. But now there's always a picture or a tweet or whatever. "The lads I've worked with are fantastically fit so if they have a Christmas night out at the right time, I've no problem with it." Former Premier League striker John Hartson: "Years ago, when I arrived at Arsenal in 1995, there was a big drinking culture at the club. Now, though, players tend to look after themselves better because the game has moved forward so much. "There are people out there now to get stories. There was a guy videoing me on the train coming up today while pretending to read his paper..."
"Harry Redknapp has picked a really good team to play Everton. He's got pace in wide areas and that will help nullify the threat from Everton. They'll pack the midfield and Goodison is a similarly tight ground to QPR. Now they just need to recreate their home form here." QPR manager Harry Redknapp on leaving Bobby Zamora on the bench: "We're playing with two wingers with one up front, so we've just changed the system a little bit. We're trying different ways of trying to find a result away from home. "There's enough people in the team who can score, they've just got to go out and do it." Redknapp said defender Steven Caulker was omitted as has not recovered from concussion. "Everton are making too many mistakes at the moment. Phil Jagielka has said in his programme notes that they've struggled to balance the Europa League and the Premier League. Now is the time for them to focus on the Premier League. "This - the Christmas period - is the defining moment in their season." Everton manager Roberto Martinez on tonight's opponents: "QPR's season has changed. In the performance against Liverpool we saw how competitive they can be. "Their performances in the recent period have been very good. Today we expect a really difficult game. They've got a lot of pace in the side and we expect it to be competitive." 'Tis the season to be jolly. Merry. Tipsy. Silly. Christmas party season. What's not to love? Like myself you may still be nursing a hangover from your office shindig last week, but QPR midfielder Joey Barton was quick to set the record straight over headlines around his festive do. Newspaper reports suggested that Barton was involved in settling a fight between defender Steven Caulker and a partygoer. Speaking on 5 live Barton said: "The headline was ridiculous. "I didn't even see it so I couldn't even take credit for being a peacemaker. It was miles off the reality." Former bricklayer Charlie Austin has downed tools since becoming a full-time Premier League striker, but what other trades could our top-flight brethren consider as alternative industries? "Well, I do sell dusters, but that's about five percent of what we do..."Image caption: "Well, I do sell dusters, but that's about five percent of what we do..."
Can you see Mario Balotelli as a conceptual modern artist? Would Brendan Rodgers or Jose Mourinho make good salesmen? Could David de Gea turn his attentions toward saving the environment? Let's hear your suggestions. QPR make four changes from the side which beat Burnley. Charlie Austin is of course banned so it looks like a change of system, with Eduardo Vargas, Matty Phillips and Junior Hoilett in attack. Defender Steven Caulker - who definitely didn't cut his head open in a fight - is not in the side. QPR: Green, Yeung, Dunne, Onuoha, Isla, Phillips, Barton, Fer, Mutch, Hoilett, Vargas. Everton make three changes from the side which was beaten by Manchester City nine days ago. Ross Barkley, Steven Naismith and Aiden McGeady are in an attacking line-up. Everton: Howard, Baines, Distin, Jagielka, Coleman, Besic, Barkley, Mirallas, Naismith, McGeady, Lukaku. QPR's away form has been dreadful - but then again Everton's home form has not been so clever of late. Usually reliably solid at Goodison, Roberto Martinez's side have won just two of the last eight home games in the top flight. Too predictable? Too nice to play against? Or just unlucky? Join Mark Chapman on 5 live for the Monday night club from 19:00 GMT. Chappers is joined by Phil Neville before full commentary from Goodison Park from 20:00 GMT. Conor McNamara is the man behind the microphone, with ex-Toffees skipper Neville on hand to provide analysis. You can listen to all of the radio coverage at the top of this page. Charlie Austin's eight Premier League goals so far for QPR have kept Harry Redknapp's side in with a chance of fighting the drop. But without him tonight, Redknapp must find a way of bringing their horrible away record to an end. QPR have lost all seven games on the road this season, scoring just twice. Can Bobby Zamora and co rally round to end the drought? We should have confirmed team news for you shortly. But without Charlie Austin (14 games, eight goals) who can QPR turn to up front? Bobby Zamora has no goals in 12 appearances in the Premier League this season, Eduardo Vargas has two in 10 and, er, that's about it. It is not a well-trodden path. From the Hellenic League (Division One, East) with Kintbury Rangers to the Premier League with Queens Park Rangers, Charlie Austin's tale is straight out of a comic book. Released from Reading for being too small, he worked as a brickie in non league, scoring headers as regularly as laying them. Moves to Swindon and Burnley soon followed, and now only Sergio Aguero, Diego Costa and Alexis Sanchez have scored more Premier League goals than he has. He's scored 50% of QPR's goals this season. But he is suspended at Everton tonight. How do Rangers replace the barnstorming bricklayer?